SHRUTI GUPTA CHANDRA Shruti has had her initial training at Triveni Kala Sangam. She was awarded the National award for her work in 2005 by the Lalit Kala Akademi. Shruti also received the All India award of the All India Fine Arts and Crafts Society for her work in 1986 and 1995. Shruti has been awarded the Cultural Scholarship for Painting by the Government of India, from 1984 to 1987. She has also been awarded the Junior Fellowship by the Department of Culture, Government of India in 1991 for three years. 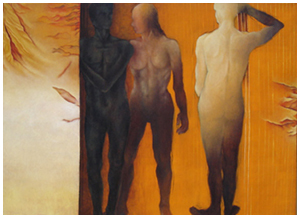 Shruti has had a Solo Exhibition of her Pencil and Pastel works in 1994 at the Shridharani Gallery, New Delhi. 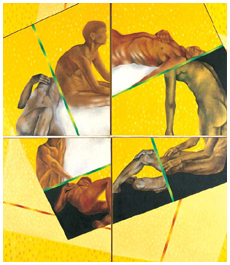 She exhibited works titled `Chapters Recreated’ at the same venue in another One-Person Show in 1997.Contours of Being’ formed the core of her next Solo Exhibition of paintings at the Shridharani in 2001. Her next solo exhibition, also at Shridharani Gallery was called ` Structures Of Visuality” in 2003.